Followed by a guided 30-day raw food challenge w/ weekly potlucks, recipe ideas, nutritional information and support. 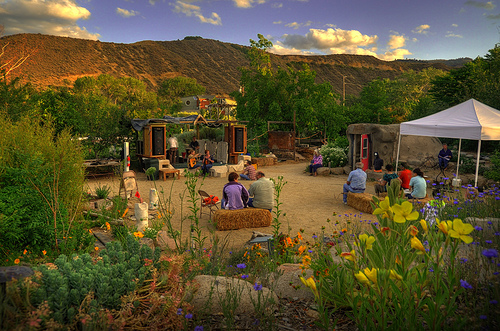 sustainable living, bioregional design, and creative expression. We grow fruit, vegetables, flowers, herbs, raise poultry... and milk goats! Our special events include everything from weddings and festivals, to birthday parties, family bar-b-ques, and eco art camp for kids. The River School Farm also hosts a variety of classes and workshops that are open to the public, including tango dance, yoga, music for toddlers, drumming, fire spinning, gardening, informative nature walks, and more! Tucked away along the banks of the beautiful Truckee River you will find Reno's biggest little secret; the River School Farm meadow, two stages, unique metal sculptures, and a stone step amphitheater, all of which help create a unique and geographically specific venue for high desert weddings, shows, and birthday parties.